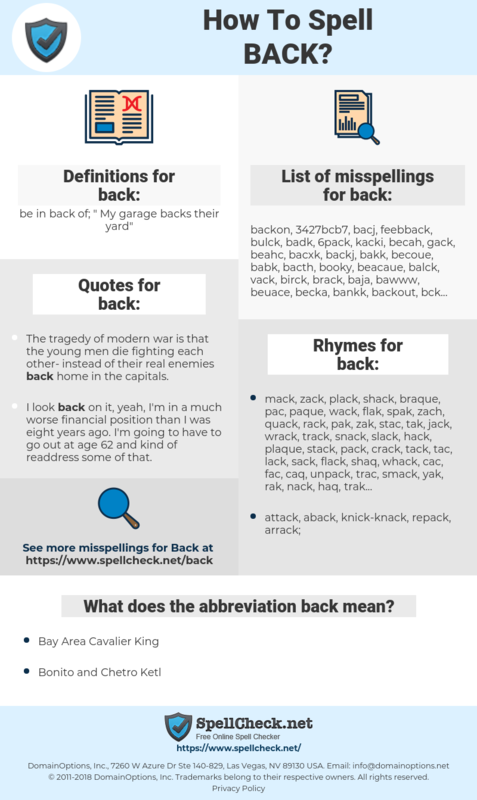 What are the misspellings for back? What are the common mistypes for back? What is the definition of back? What does the abbreviation back mean? What are the quotes for back? What are the rhymes for back? What are the translations for back? 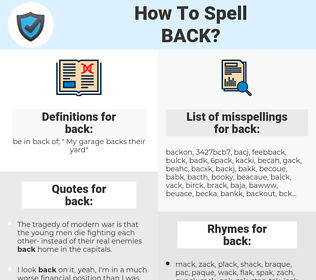 What are the common typos for back? This graph shows how "back" have occurred between 1800 and 2008 in a corpus of English books. The tragedy of modern war is that the young men die fighting each other- instead of their real enemies back home in the capitals. The last time I spoke with Robert was back in May. When his wife was murdered, I talked to several radio stations in defense of him because I know how Bobby Blake really is, and as far as I'm concerned, there's no murder in his heart. When I retire or pass away, I will be able to look back and say that this has been an exciting life. That's all that matters. Bali, achterst, achterstallig, rug, achterkant, achterzijde, rugzijde. soutenir, appuyer, renforcer, dos, arrière, verso, râble. Schluss, setzen, decken, Fond, Dossier, Lehne, Revers, Hintergrund, Kehrseite, Heck, Queue, rückwärtig, zurück, retour, Buckel, Hinterseite, Wagenfond, lateral, Rückwand, Rückenlehne, Rückfront, zurückschieben, auf setzen. バック, 裏面, 背部, 擁立, せごう, ようりつ, はいぶ, 背甲, 後ろの. suporte, fundo, apoiar, costas, parte de trás, encosto, lombo, dorsal, de volta, atrás, endossar, anteriores, traseiro, traseira, apoio, fundos, posteriores, parte traseira, lombares, retrospectivo, secundário, no passado. lejos, financiar, posterior, fondo, respaldar, espalda, dorso, respaldo, reverso, lomo, trasera, atrasado, atrás, retroceder, trasero, defensa, columna, interior, secundario, alejarse, cara posterior, parte trasera.